Utah Roses and Flower Co. 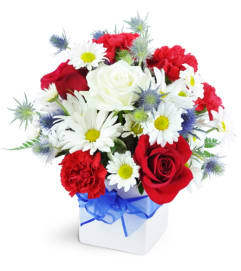 When just a few just won't do, give our Blooming Medley™ bouquet! It's bursting with a variety of beautiful blooms to brighten a special someone's day. Purple hydrangea, magenta daisies, yellow roses, yellow daisy mums and much more make this sweet floral gift a feast for the eyes. Whether it's a birthday, Mother's Day, Administrative Professionals' Day or any other occasion, this arrangement is a memorable gesture. 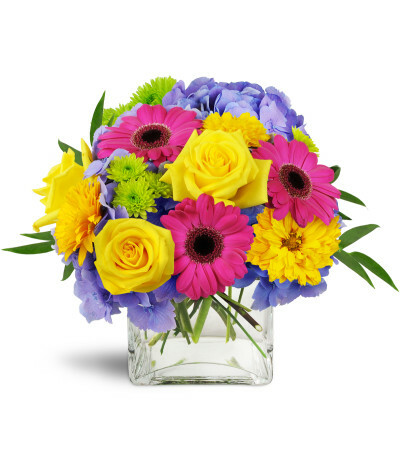 Purple hydrangea, magenta Gerbera daisies, yellow roses, yellow daisies, and more are arranged in a modern clear glass cube vase. 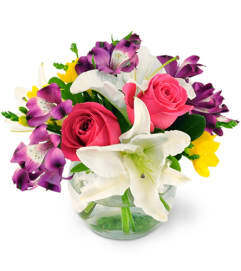 the vase was lovely, the arrangement beautiful, my daughter was delighted, you will definitely be the One I use . I'm now a repeat customer. 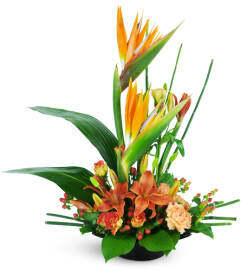 I love that I can order online and the perfect arrangement is delivered on time. She loved it! 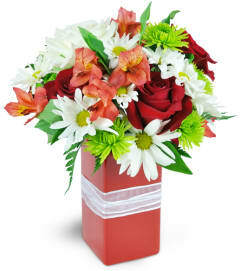 Utah Roses and Flower Co. is a Lovingly Florist in Draper. Buying local matters. Discover how Lovingly supports local florists. Copyrighted images herein are used with permission by Utah Roses and Flower Co..